What influenced you to start writing and how old were you when you started? I started writing poetry at around 10 years old, at the encouragement of my teacher and my mom. I also started competing in poetry recitation contests, which were a really fun excuse to memorize great poems. I still know at least a large bit of e.e. cummings' "Anyone lives in a Pretty How Town" and Louis Simpson's "My Father in the Night Commanding No" because of contests in the 5th and 6th grades! Do you have a writing routine? If so, what is it? If not, why not? I've always been what I call a "regular sporadic" writer - I wrote in fits, sometimes two poems at a time, sometimes four poems a month. Now I'm trying to make a more concerted effort to write twice weekly. Even if I don't love the results, it's a good practice. You came back to poetry during a time of illness, when your previous career path wasn't sustainable. What was your official diagnosis and how did writing affect your outlook on your diagnosis/symptoms? Yes, I had to quit a fairly demanding job as a technical manager at Microsoft because of my health. I didn't have many of my conditions diagnosed properly until years later - but it turned out I had a primary immune deficiency, a heritable bleeding disorder, plus early signs of the neurological problems that would become more serious later on. My husband encouraged me to go back to school to get an MFA after I quit my job - and because I was in a low-residency program, I was able to participate even while I was dealing with health struggles. Half-way through the program, I had my first book accepted for publication. It definitely took taking time off to get serious about - not reading and writing so much as the part I hadn't had time for - submitting, editing, volunteering, reviewing, etc. My health issues have had a huge influence on my writing - and my writing is a great practice that sustains me in the middle of physical illness, injuries, etc. .
You write fairly often about changes in the (female) body, often with fantastical elements. Has your relationship with your body influenced this interest? If so, in what way? One of the recurring themes in my work is the horrifying, the grotesque, and the monstrous - probably because I've always identified myself as a real-life mutant and being female is already treated as somewhat grotesque and monstrous by our culture. Selkies, mermaids, and dragons, in particular, repeatedly appear in my work. I also explore the tropes of comics - how supervillains are often portrayed as having mutations, illnesses/deformities/things that keep them in wheelchairs. I think if I didn't feel like quite so much of a medical mystery, I might not be quite so interested in these tropes. Readers of your speculative poetry reach out to you more often than literary poetry readers. Why do you think that is? Do you think "genre-snobs" are less of an issue in poetry than in fiction? It is interesting that I think maybe more people who are interested in my work happen to be fans of speculative and genre work. Maybe these people are more enthusiastic readers than poets are, in general? There are probably still people who don't want their poetry "contaminated" by speculative elements - but notice that Tracy K. Smith, whose Life on Mars was maybe one of my favorite speculative books of poetry, just got named Poet Laureate of our country, so I think the barriers between "literary" and speculative have been breaking down. How important to you is the form/style a poem takes? Is there a form/type of poem you'd never try? My early training in poetry was very much in a formalist bent, which I think I've mostly reacted against. I did embrace Japanese forms like haiku and haibun, especially in the years I was studying the language, culture of folklore of Japan, because those forms seemed more freeing and interesting to me than the sonnet, sestina, villanelle, etc. I've always been interested in hybrid forms, so I do mess around with couplets, prose poems, mini-paragraphs in poetry, that sort of thing. You served as poet laureate of Redmond, Washington. Was the appointment a surprise? What was the most unexpected part of the position? No, it was actually a position I was nominated for and then had to apply, just like a job application, and interview for, so by the time it happened, it was not a surprise. Although the fact that Redmond, a city mostly known for its tech (it's the home of Microsoft, among other companies) felt it was important to have a poet laureate program at all, was really exciting to me. The most surprising part was when I got to talk about poetry to Redmond's mayor and interact with local artists - those seemed like great moments of the intersection of civics and literary arts. The most enjoyable part was speaking with teenagers at local schools and doing youth workshops for the city. Redmond's young people are amazingly, inspiringly smart and driven. There's a big list! I think the biggest influencers have been Margaret Atwood, Louise Gluck, Haruki Murakami, Lucille Clifton, a Japanese writer named Osamu Dazai who is very well known in Japan but less well-known in America, and Kelly Link. Probably fairy tales, comics and television shows have also provided a lot of the inspiration for my work - probably from childhood experiences being sick and stuck indoors, I absorbed a lot of imagination ammunition from watching Miyazaki's movies and reading Andrew Lang's color series of Fairy Books. What is the worst piece of advice you've ever received on writing/publishing? Did you take the advice? If so, what happened? Strangely enough, I feel like I didn't get a lot of advice about publishing in either my M.A. program or my MFA program. I kind of had to stumble into the "business-side" of poetry for myself, which is why I've been a big fan of projects like the Poet's Market for new writers and have been writing a how-to book for poets about publishing and PR. I also had a group of friends, early in my writing career, who got together to talk about submissions and markets and that was a great thing for me. I really encourage writers to get together to encourage and support each other this way. The writing life is a LOT about rejection - and that can be hard to deal with in isolation. The poetry world can feel like such a secret club, and I don't like that feeling of exclusivity. Poetry should be for everyone - both reading it and writing it. You're writing a nonfiction book about PR just for poets. Why is it so important for a guide to be written specifically for them? Do you think a lot of books about marketing/branding leave poets out? Note from Jeannine about her medical issues: About a decade ago, I started having mysterious falls and some motor skill issues as well as numbness in my hands and feet. These were symptoms I had had for a while but hadn't thought much about, writing them off as clumsiness or stress. A neurological exam - suggested after an orthopedic surgeon determined one of my bone breaks was probably caused by neurological problems, not just "clumsiness" - revealed neurological damage, and my MRI revealed a handful of lesions in my brain. It was unclear then what the lesions were. I had a new one show up last year. After workups for things like MS and stroke, the current thought is that a lifelong inability to process b12 - not just through my diet, but even shots - has caused permanent neurological damage. I started physical therapy especially for the proprioception and motor skill issues six years ago, when I was told I would be in a wheelchair permanently by three different neurologists. Though I still have setbacks that require a cane or even the wheelchair, I am happy to state that though my problems may continue and worsen as I age, the physical therapy had some success - enough to make walks in the park and going to readings without a cane a possibility for me again. Biography: Jeannine Hall Gailey recently served as the second Poet Laureate of Redmond, Washington. She’s the author of five books of poetry: Becoming the Villainess, She Returns to the Floating World, Unexplained Fevers, The Robot Scientist’s Daughter, and Field Guide to the End of the World, coming from Moon City Press in 2016. Her work has been featured on NPR’s The Writer’s Almanac, Verse Daily, and in The Year’s Best Fantasy and Horror. Her poems have appeared in The American Poetry Review and Prairie Schooner. 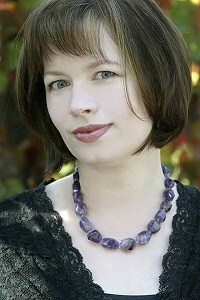 Her web site is www.webbish6.com and you can follow her on Twitter @webbish6. But she also encourages people to seek out and support small publishers by buying the books directly from them - Steel Toe Books, Two Sylvias Press, New Binary Press, Moon City Press, Mayapple Press. Thank you again for posting this. Ironically, a little bit after I turned this in, I ended up in the hospital - and came out with an MS diagnosis. Why I'm No Longer a "Grammar Vigilante"